Register and never miss anything! 1. A chance for Alpha and Beta access. 2. Win amazing prizes such as custom consoles, For Honor gear, and more. 3. Updates on the latest and greatest news on the game. Register for Alpha, Beta, exclusive rewards & updates!Register today! Congratulations on being selected to play For Honor’s Closed Beta! Your feedback is very important to us, and we want to hear all of your thoughts on our game! Head over to the dedicated event forums to leave your feedback and learn more about what we have prepared for you in this Closed Beta. Please also note you can help us track issues you might come across in the game by reporting them through the Contact Support tab below. The For Honor Closed Beta begins on January 26th at 9 h AM EST / 2 h PM GMT and runs through January 29 at 8 h PM EST / January 30 at 1 h AM GMT. You can pre-load the game starting January 23rd. All participants in this Closed Beta have also been granted access to our event forums. All you need to do is to click on any forum link and log in with your Ubisoft credentials. Join the conversation about the Closed Beta. Everything you need to know about our our Closed Beta content. Let us know what you think about the game! Get help for any problems playing the game. Q: What is the purpose of this Closed Beta? Step onto the battlefield in our Closed Beta and help lead your faction to victory in the War of the Factions. Then give us your feedback to help build best the best experience of For Honor for launch in February 2017. Q: How long does the Closed Beta last? The For Honor’s Closed Beta begins on January 26th at 9 h AM EST / 1 h PM GMT and runs through January 29 at 8 h PM EST / January 30 at 1 h AM GMT. For any updates or changes to the schedule please refer to the event forums. Q: Can I talk externally about the Closed Beta? Can I post pictures or stream my game? Yes. You can share your best moments with your friends and fans on any channel you'd like. Q: Where can I find my Closed Beta code? No need for key. Launch the Uplay PC on your computer and the For Honor game will be available for download within your library. Q: How do I redeem my PS4 or Xbox One Closed Beta key? If you received a PS4 key (12 digits, example ABCD-1234-XYZA) go to Playstation Store and select "Redeem codes" at the bottom of the menu. Once the key has been redeemed, select "Download" to start downloading the game. If you received a Xbox One key (25 digits, example ABCD123456EFGH7891IJKL234) On Xbox One, select Xbox Store > Browse games > Use a code. Once the code has been redeemed, the game will start downloading on your console. Q: I took part in the last For Honor Alpha on Xbox One and was selected to take part in the For Honor Closed Beta. How do I access the game? Q: What are the PS4 technical requirements? Q: What are the Xbox One technical requirements? - Sharing content privacy, located under Xbox Live privacy & safety account settings, must be set to "everybody" to create and share your emblem. - Joining Multiplayer Gameplay must be allowed in the privacy & Online safety setting of your profile. Q: What are the PC technical requirements? Note: All our tests were performed using only the latest digitally signed drivers for both AMD (Crimson 16.9.1 for HD7000 series and above, and 15.7.1 for HD6000 series) and Nvidia (Geforce 372.70). Q: What are the PC supported graphic cards? Q: What are the PC supported controllers? Q: What are the game languages supported during the For Honor Closed Beta? America: English, French, Brazilian Portuguese and Latin American Spanish. Europe, Africa, Asia and Oceania: English, French, Italian, German, Spanish, Latin American Spanish, Brazilian Portuguese, Dutch, Polish, Czech, Korean, Simplified Chinese, Traditional Chinese. English, French, Italian, German, Spanish, Latin American Spanish, Brazilian Portuguese, Dutch, Polish, Czech, Korean, Simplified Chinese, Traditional Chinese. English, French, Italian, German, Spanish, Latin American Spanish, Brazilian Portuguese, Japanese, Dutch, Polish, Czech, Korean, Simplified Chinese, Traditional Chinese, Arabic. Q: What countries are supported? The Closed Beta will be available for all countries with the exception of Japan, Mainland China and North Korea. Q: Are we playing the full game? This Closed Beta comprises a limited portion of the game and is a work in progress – it’s not the full nor the final game. For Honor will include more Heroes, more modes - including a full-fledged story mode, more maps and more features when the game launches on February 14th, 2017. Q: How can I access the Closed Beta event forums? As a participant of the Closed Beta, you are automatically granted access to the event forums. You can access them by clicking the link here and, if you aren’t already, logging in to your Ubisoft account. During the test, the Announcements subforum will be your main destination to keep you informed on the latest news and updates. Important messages can also be broadcasted in the game’s main menu. Feedback and suggestions can be made in the Game Feedback subforum. Make sure to file your feedback in the most relevant section. Your feedback is very important for us and is the main reason why we’re doing this Closed Beta, so we would love to hear from you! For all support issues, proceed to the Technical Support subforum and submit a post detailing your issue. You can submit bug reports by clicking the CONTACT SUPPORT tab on the private website. Please give us as many details as possible about your issue, so we can attempt to reproduce it. The more details you give, the more likely we can track down the bug and fix it. Q: How can I invite a friend to take part into the For Honor Closed Beta? You can invite up to 3 of your Uplay friends to dive into battle at your side on the same platform as you. To do so, simply go to the INVITE FRIENDS tab on the private site homepage. Please note that the geographical restrictions will also apply to your selected friends, they have to live in one of the supported countries for this Closed Beta (All countries are supported except Japan, China and North Korea). If your selected Uplay friends live outside those countries, they won’t be able to subscribe and play. Once you invite your Uplay friends, they will receive an email with all necessary information. They will have 48 hours to accept their invitation. Any unaccepted invitations will be returned to you, to re-invite your friends, or invite other friends. Q: Who can/can’t invite friends in the Closed Beta? 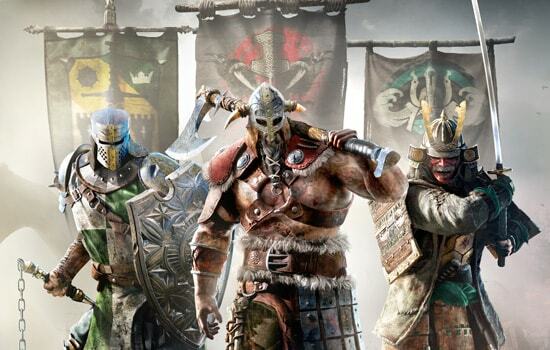 Only players that have been invited by Ubisoft have the possibility to invite 3 friends to join them in the For Honor Closed Beta. If you’ve been invited as a friend or used a guaranteed access code, you will not be able to invite any additional people. Q: What is Player Activities? Player Activities is part of the game experience. During this Closed Beta you will have access to some of the game features on the Web. Create, edit and manage all you game emblems on the Web. See your progress and compare your hero stats with your Uplay friends. All features require that you log in using the same Ubisoft account you used to play the game.